There are few companies in South Carolina that come close to offering one-stop shopping for the broad array of custom embroidery options that we offer! Our in-house graphic design and production allows us to offer quick response, convenience, and value. We make it easy for you to Design, Buy and Share and Sell customer-designed sportswear, accessories and signs/banners without minimum order or setup restrictions. We offer the latest printing technologies that turn blank, basic garments into vibrant, fashion-forward and unique attire! For more information on Custom Shirts contact us. Your digitized logo will be saved in your account and can be used on any of our thousands of embroidery ready products. Don’t believe us? Read our 5 star reviews. Serving Columbia SC, unlimited options are available for your custom embroidered apparel. 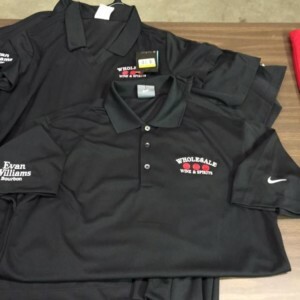 Logos can be embroidered in a small format size (maximum size 4″w x 4″h) under the collar of your shirt, jacket or embroidered text under the collar across the shoulder blades (text will be approximately 1″ high characters). Once your embroidery logo is set-up the first time, you can easily re-order without minimum order restrictions. Please note: The digitized file is created in a proprietary format by our artwork team in order to give you the highest quality finished product available. We can not email or sell the digitized files because of this. Your digitized logo will be saved in your account and can be used on any of our thousands of embroidery ready products.